When it comes to friendship, animals definitely do not discriminate. 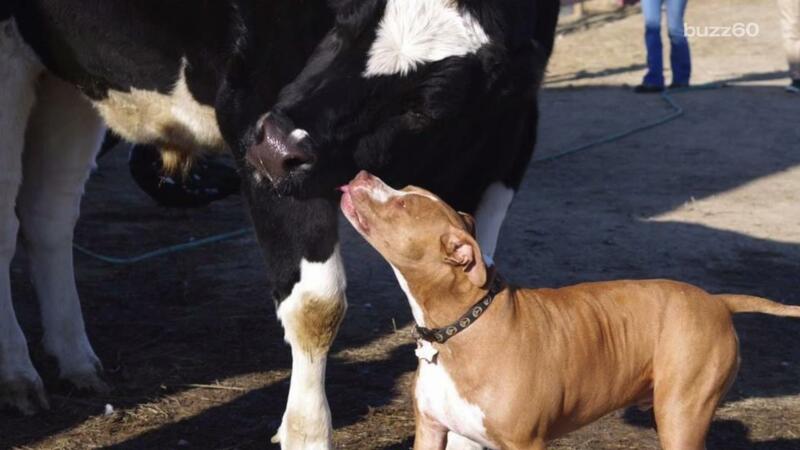 The most unlikely pairs can become best pals... and it has been proven yet again when a cow and a pit bull found happiness together. Wesley and Chance were both rescued from bad situations. Wesley, the cow, was saved from a veal hut when he was just a calf. Mindy Mallet from the Sunrise Sanctuary took him home to offer him a better future. Chance the pit bull was also mistreated. His first owner bought him at a flea market. He was brought home and locked in a bathroom, all day and night. Mallet rescued him as well. So, Wesley and Chance have a lot in common. They had unfortunate experiences, were both saved by the same kind soul, and both of them were taken from their mothers at a very young age. Everything they have in common just makes their relationship even more comforting. Though, there are some differences. When they met, the two were similar in size, but have grown at rapidly different rates. Wesley is six feet and four inches tall, and he weighs more than 2,500 pounds. Wesley towers over Chance, the nine-year-old pit bull mix. Fortunately, at the end of the day, these guys know that what matters most is what's on the inside.